This route crosses the busy A465 behind Abergavenny railway station and continues onto the wooded sloped of the Little Skirrid. 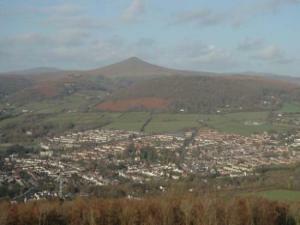 A steep path delivers you to the cleared summit for breathtaking views over Abergavenny and the surrounding hills. Forestry Tracks take you down the back of the hill and you return through fields skirting the hill. Natural springs and other wet corners mean this route is best walked after a dry spell or when the ground is frozen. Rough paths across farmland – can be very muddy. Steep rocky path on west side of Little Skirrid, recommended to walk this route clockwise so you go up this steep path. Pay and display parking at the bus station car park. Tourist Information Centre, public toilets and snack bar. Numerous pubs, shops and other facilities near start. Café and toilets at the railway station.